Cologne’s trendy quarter Ehrenfeld is known for its street art, excellent nightlife and colourful mix of cultures. And the culinary scene is just as diverse with Portuguese tapas, Buddha bowls and Schnitzel on local menus. Here are the ten best restaurants in Cologne’s most vibrant district. After the concept proved popular in Cologne’s Südstadt and Lindenthal quarters, the Bagatelle has moved into Ehrenfeld. This quaint and cosy restaurant serves French tapas – expect small portions of quiche au saumon, boeuf bourguignon and beetroot carpaccio. The small café Saudade wins over its guests with welcoming decor, fantastic Portuguese wines and delicious tapas. The menu changes regularly but you can expect local specialties such as Bacalhau (dried and salted cod) and Bitoque (Portuguese steak with fried eggs). Good news: you can take home some local treats such as olive oil, honey and marmalade. The corner café and restaurant Maifeld is open all day. Food is served in the no-fuss dining rooms or on the large panoramic terrace. The typical German breakfast – with a range of bread, cheese, sandwich meats and spreads – makes way for soups, salads, burgers or tarte flambées for lunch. Dinner options include healthy Buddha bowls, Moroccan roast chicken and various fish dishes. The burger joint has won over Ehrenfeld’s omnivores and vegetarians in its two-year existence. The chefs at Bunte Burger create yummy vegan burgers with ingredients you wouldn’t usually expect to find in a burger joint, such as polenta patties and pulled jackfruit burger. Due to high demand, the Speisesalon catering service opened its Oskar Jäger Deli where they have a weekly-changing menu of their best dishes. Only open for lunch Mondays to Fridays, they serve salads, soups and quiche, plus one meat dish and a vegetarian option daily. Haus Scholzen serves hearty traditional German foods in a rustic yet chic atmosphere. The menu changes daily but you’re sure to find some local specialties such as Rievkooche, Soorbrate or Flönz. The chef uses only fresh and seasonal meat, fish and produce. Cologne’s oldest Greek restaurant has lured locals with its friendly atmosphere and traditional food since 1974. The family-run locale is only a few minutes away from Ehrenfeld train station and serves the best of Greek cuisine – souvlaki, saganaki and moussaka included. The café serves great food all day, from fresh croissant and muesli for breakfast, quiche and salads for lunch and Thai curries and Schnitzel in the evening. And that’s not all – even if you’re not planning to eat at all, Goldmund is a great place to just sip on a coffee and browse the hundreds of books that are stacked on the shelves around you. The American-Italian Tex-Mex restaurant The Shepler’s is dedicated to serving authentic southern food. Meat-lovers face the challenge of choosing between full stack spare ribs, chicken wings, rib-eye steak and burgers with a side of curly fries, nachos or corn on the cob. The vegetarian choices are comparatively puny but they do have baked potatoes and a veggie burger on the menu. 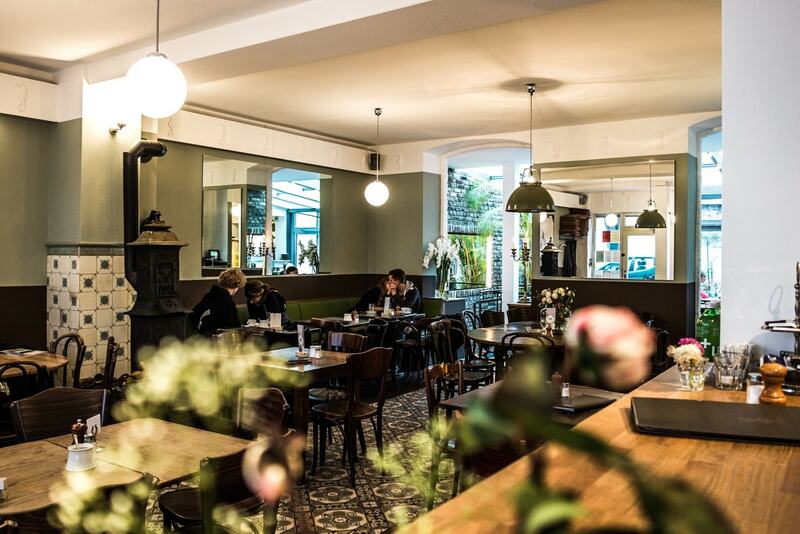 Café Sehnsucht is one of Ehrenfeld’s most popular cafés with excellent organic foods and a home-like atmosphere. The coffee is from the nearby Van Dyck roastery and the local bakery delivers fresh bread every morning. Fresh eggs and french toast are available for breakfast, salads and focaccias for lunch, risotto and steak for dinner, and delicious cake and coffee anytime in between.